CLARIN (Common Language Resources and Technology Infrastructure) is a European Research Infrastructure Consortium (ERIC), an ESFRI (European Strategy Forum on Research Infrastructures) initiative which aims at (a) making extensive language-based materials available as primary research data to the Humanities and Social Sciences (HSS) research communities; and (b) offering state-of-the-art language technology (LT) as an e- research tool for this purpose, positioning CLARIN centrally in what is often referred to as the digital humanities (DH). Swe-Clarin as the Swedish CLARIN node was established in 2015 with funding from the Swedish Research Council by a consortium consisting of 9 members – so-called Swe-Clarin centers – representing the Swedish academic community as well as public memory institutions. The academic members are well balanced over the LT field, covering existing and possible research areas and user groups, and the memory institutions provide access to many of the language-based materials of interest to the users. Swe-Clarin is coordinated by Språkbanken, University of Gothenburg. From the start, Swe-Clarin has aimed to establish good relations to the HSS fields and open the door for all researchers who wish to work with DH research using text and speech as primary research data. To avoid being a project by language technologists for linguists, we strive to include the HSS researchers in the process as early as possible. Our preferred way of doing this has been to establish small pilot projects with at least one member from the HSS field and at least one Swe-Clarin consortium member, together formulating a research question the addressing of which requires working with large language-based materials. Ideally, the collaboration should additionally always include a data owner, a person or persons representing the institution where the text or speech data is kept – typically a memory institution. The pilot projects aim to spread the word of Swe-Clarin, show the potential of using language technology in DH research, create a user base for the tools and resources developed and maintained by Swe-Clarin, and last but not least, having this development being informed by input from users in the earliest possible stages of the project. Some pilot projects are already underway (see below). In addition to the pilot projects, we have arranged workshops and user days and published newsletters and a blog. The workshops held so far have been on topics such as: general introduction to Swe-Clarin, our tools and resources; historical resources and tools; making cultural heritage text data available for research; and HSS research on digitized speech data, such as those of the Swedish Media Archive. We have started a series of workshops called Swe-Clarin on tour where Språkbanken’s widely used Korp corpus infrastructure (Borin et al. 2012) is used to explore previously unexplored materials in a hands-on manner, giving researchers of LT and HSS the opportunity to meet and discuss research questions and the potentials of using LT for DH. The experience from working with HSS researchers will help reveal the limitations of existing tools and hopefully also engender general methodological discussion, thus setting the stage for future development of tools more appropriate for DH research. The first such workshop was held at Stockholm University in the spring of 2016. It featured the ethnographic questionnaires collected by the Nordic Museum since the late 1920s and now digitized by them, and it was attended mainly by ethnologists. The next workshop in the series will be held in Umeå in conjunction with the Swedish Language Technology Conference in November 2016. There the material in focus will be the Swedish Government Official Reports (Statens offentliga utredningar, SOU), in the version digitized by the National Library of Sweden, comprising more than 400 million words covering the years 1922–1998. We strongly encourage you to contact us if you are interested in any of our resources, in conducting a pilot study with us or if you have any ideas or questions regarding digital humanities research with respect to language technology and resources: <info@sweclarin.se>. See also <https://sweclarin.se>. Borin, L., Forsberg, M., & Roxendal, J. (2012). Korp – the corpus infrastructure of Språkbanken. In Proceedings of LREC 2012 (pp. 474–478). Istanbul: ELRA. Megyesi, B., Näsman, J., & Palmér, A. (2016). 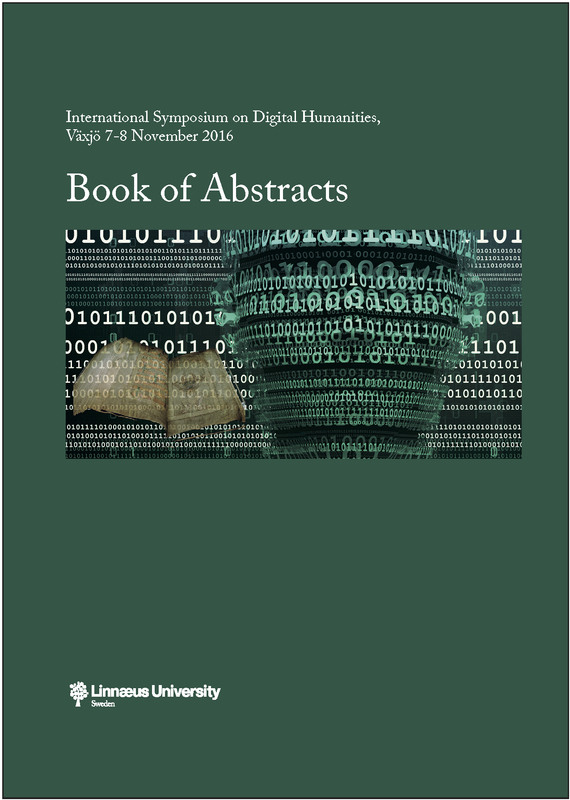 The uppsala corpus of student writings: Corpus creation, annotation, and analysis. In Proceedings of LREC 2016 (pp. 3192–3199). Portorož: ELRA. Nilsson Björkenstam, K., Gustafson Capková, S., & Wirén, M. (2014). The Stockholm University Strindberg Corpus: Content and possibilities. In R. Lysell (Ed. ), Strindberg on international stages/Strindberg in translation. Cambridge: Cambridge Scholars Publishing. Viklund, J., & Borin, L. (2016). How can big data help us study rhetorical history? In Selected Papers from the CLARIN Annual Conference 2015 (pp. 79–93). Linköping: LiU EP.